My second to last run before we head out to New York City. It was a good one. I ran a 5k. 3.1 miles at my current 5k pace. I ran it without any walk breaks. Any every mile was faster than the previous mile. I did a training run at the gym of 15 miles about a month ago. 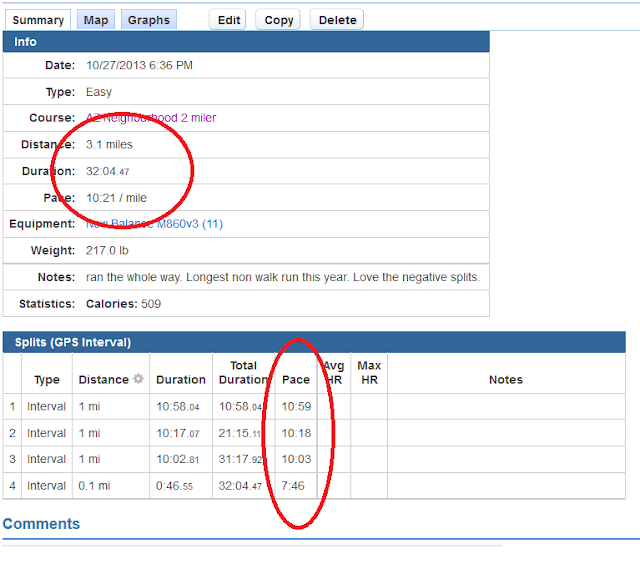 At that time I would run 4/10 of a mile (four laps) and then walk 1/10. I kept that up for 15 miles and I felt great the whole time. Jeff Galloway, the former Olympian recommends the RUN-WALK-RUN™ style to remain injury free and to run marathons. He recommends you start your walk intervals immediately. Like in the first mile of a marathon. I plan on running the marathon just like I ran that 15 miler back in September. 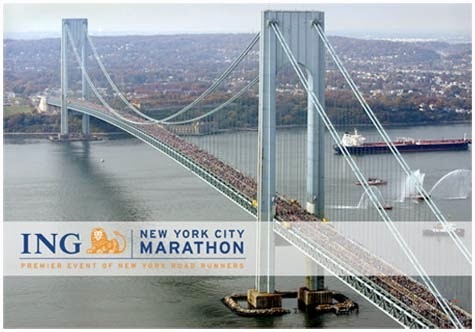 Yes, I will do a walk on the Verrazano bridge in the first mile. 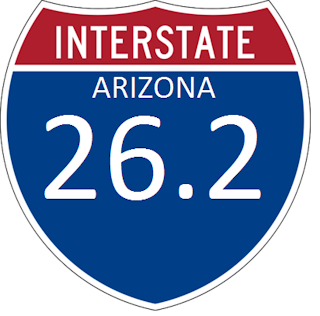 In 2 of the 3 marathons I've run I've gotten to the 20 mile mark in about 4 hours. But, I then fade badly. I'm hoping this time will be different. What I didn't train for is hills. NYC is on the ocean. At sea level. Flat, except for the bridges. Or so I thought. I've read lately that there are some hills. It's up hill in Queens and Central Park has hills. Plus, there's five bridges. 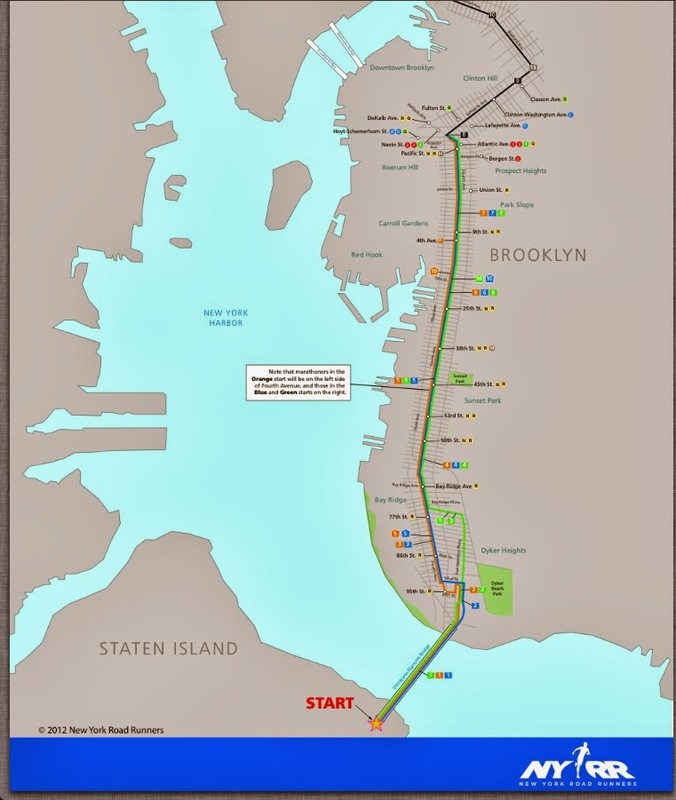 Verrazano and Queensboro are both over a mile long. You can bet my walk breaks will be on the up hill side of any bridge. Ex Red Alert: Jonny Gomes just hit a 3 run tater in the World Series. I got my running shirt from Cafe Press. I designed the front and it is shown above. The back says, "The VOICE in your head that says you can't ... is a LIAR!" Then it lists my marathons. I wore it for my run tonight to test it out. Don't do anything new on race day is the motto. I, also, wore my fuel belt (but I always do) and I attached a race bib onto it. I wanted to see if it was annoying to run with my race bib below the belt. See the picture. If I wear it this way, it will show when I have my sweatshirt and sweatpants on. The picture was taken with my phone which I planned to use during the marathon for pictures. I'm having second thoughts after seeing the quality here. I've run 3 days in a row now without any knee issues. 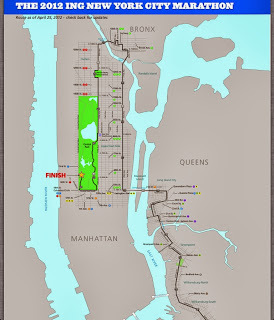 I want to run NYC tomorrow. My father's name was Joe. In his honor, I have it above my heart. 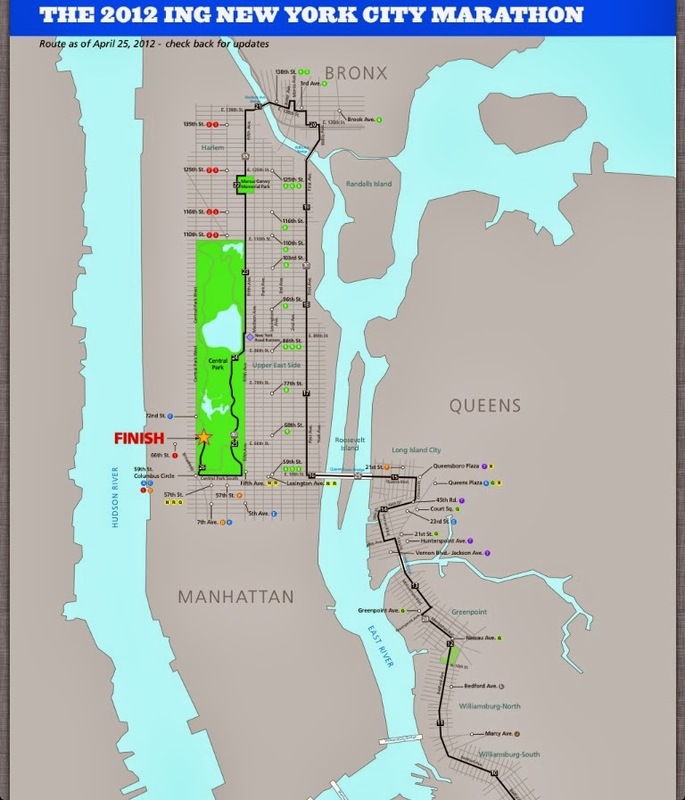 On Sunday, just 13 days before the NYC Marathon, my right knee felt horrible. I could barely walk in the afternoon. On Monday it was all better. I couldn't believe the turn around. In the evening I tested it with an easy 2 mile run in the neighborhood. One at a 10:55 pace and one at a 10:39 pace. And I felt no pain at all. I wrote about it in RunningAhead, my running log and now I'm getting ads for pain specialists. I found a blog on Zite about a gal in NYC that is running the marathon. She's funny, lost a good deal of weight and likes to take pictures while she runs. Next time you get, check out A Neurotic Glamour Girl. Good luck Sheryl. She had her bib number and start info already. I didn't think I would get this until I went to the expo. But, I can and here it is. I'm in the Green wave #4. There's three different colored waves and four different wave starts running from 9 am until 10:55. Cheetahs in the front, turtles in the back. I'm a turtle for this race. I may be slow, but I have no baggage. 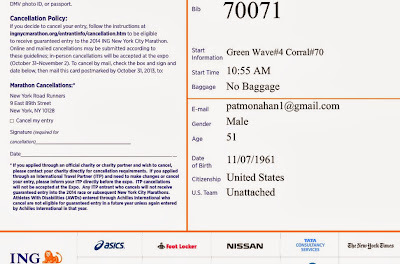 Thirteen days until I'm running in the New York City Marathon. On Saturday I woke up with a sore right knee. My knees never give me an issue. By Sunday afternoon I could barely walk and I was thinking my marathon was over before I had a chance to start. A DNS. I iced and drugged it and now on Monday my knee feels way better. My last run was on Wednesday. Five days ago. I need to decide if I will try a short run or give it one more day of rest. I'll see how it feels as the day goes on. This year has been packed with running, but not racing. In February I ran in the Diamondbacks Race Against Cancer 5k. My time wasn't spectacular. Around 35 minutes, but it was faster than I thought it would be. 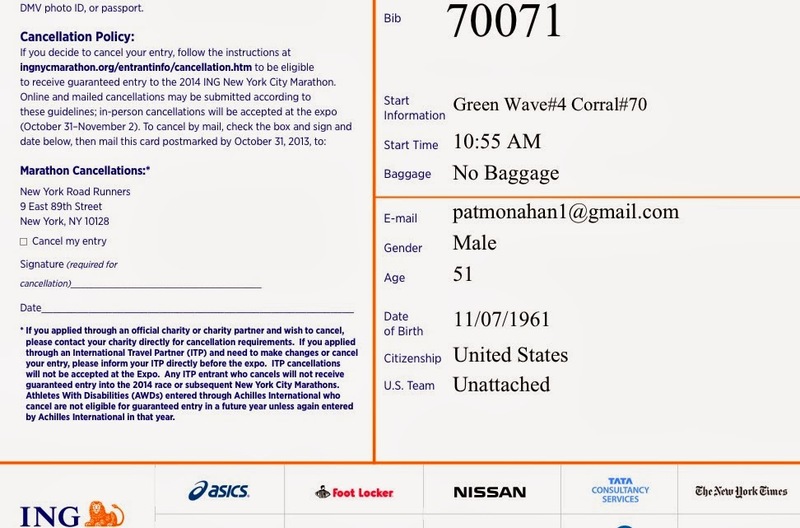 In April I found out I was accepted in the NYC Marathon. I had applied three times, lost out in the lottery three times and therefore was automatically accepted for 2013. This rule is going away after next year. I started training and avoiding processed foods. My mileage for April was less than 20 miles. I weighed over 250 lbs. I got my mileage up to over 35 in May, over 60 in June, 80+ in July, About 85 in August and over 100 in September. My weight went down to around 220 today. My long runs went from 8 up to 18 miles. I was very conservative in not adding mileage to quickly and only doing a long run every other week. I didn't do a Higdon plan or a Pfitz. It was my own plan. Yesterday I was thinking if we should cancel the trip all together or go to NYC, but watch the marathon. Today, I'm thinking I'll run and finish the darn thing.